[AUTO](RC) Generation Break 1 Ritual 3 (Active if there are three or more grade 1 cards in your drop zone):When this unit attacks a vanguard, until end of that battle, this unit gets [Power]+5000, and “[AUTO](RC):[Counter Blast (1)] When this unit’s attack hits, you may pay the cost. If you do, search your deck for up to one grade 1 card, call it to (RC), and shuffle your deck.”. [CONT](Drop Zone) Generation Break 1:This card gets grade-1. What’s up, Rogue Squad?! Today’s Throwback is to what was at one time a $30 RRR at its very lowest but having her get reprinted finally balanced her price, but with all of the newer support that Luard recently received, is she still a good card? Short answer: Oh, god, yes. 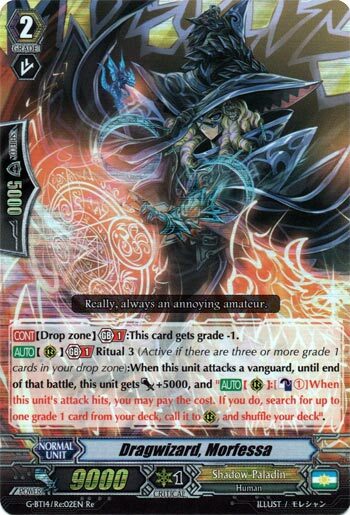 Long answer: the fact that she is a Grade 1 in the Drop Zone helps satisfy the Ritual count that Luard would need and the fact that she’s a 14k attacker on Ritual 3 with a pressure effect makes it so that with a 7k booster makes her a 15k block at minimum with a potential call on-hit. That alone should still make her a staple along with a few of the newer Grade 2’s that Luard recently had. Simply put: Play her if you’re bad playing Luard. The fact that she’s now reprinted leaves little to no excuse on why you shouldn’t be playing her in the first place now. She’s still good, right? I mean, last I checked.